At PétanqueShop, we have our own engraving workshop! Integrated directly in our premises, in Nantes, it allows us to engrave your balls very quickly, and to control the quality! 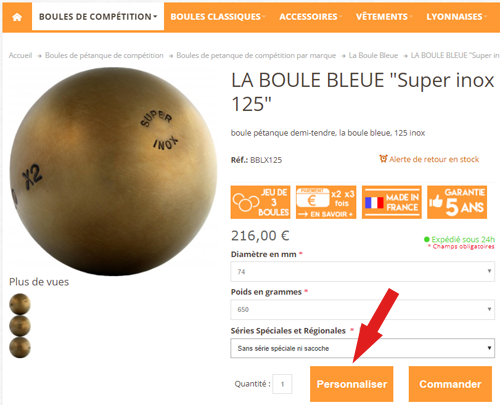 Upon receipt of your order, if your petanque game is in stock, we are able to customize it immediately. What balls can I engrave ? Engraving is available for competition balls. 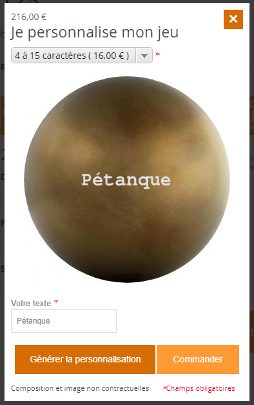 The petanque balls Obut Loisir Inox can also be personalized. Possibilities and limitations of characters depend on the model of balls and streaks. This will be specified at the time of personalization, in the product sheet. How to engrave my balls ? - Available for smooth balls and some other balls models. - Possibilities : lower and / or upper and / or numbers, special letters, accented uppercase characters (if in doubt specify your request in order comment). - Customized balls can not be returned, except for a defect.